This is my first attempt at one of Stan Ginsberg's recipes. It's the German "Franconia Crusty Boule" from The Rye Baker. 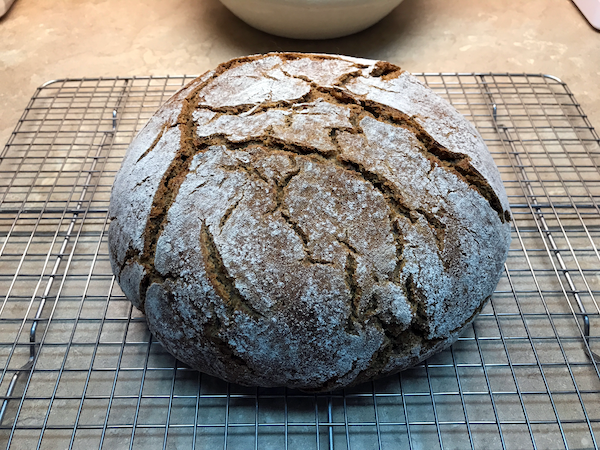 Having read his book several times, I was prepared for the inevitable "stickiness" and tenacity of working with the rye dough. And it certainly lived up to its reputation! I also didn't have dark rye on hand, so I used pumpernickel in its place. I decided to use the "bread spice" he calls for in the recipe. For the bake I used a Lodge combo cooker. I got a little impatient and cut the loaf sooner than I should have, so the crumb shots don't look great. It's a dense loaf as I expected, but the flavors are amazing! It will be better tomorrow...patience! 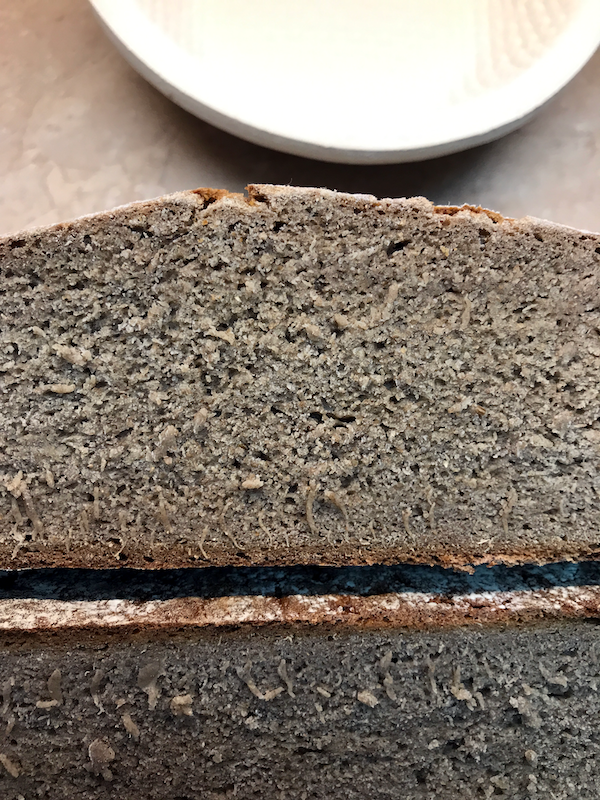 I've worked on quite a few of his breads...and this turned out well for you using the pumpernickel. 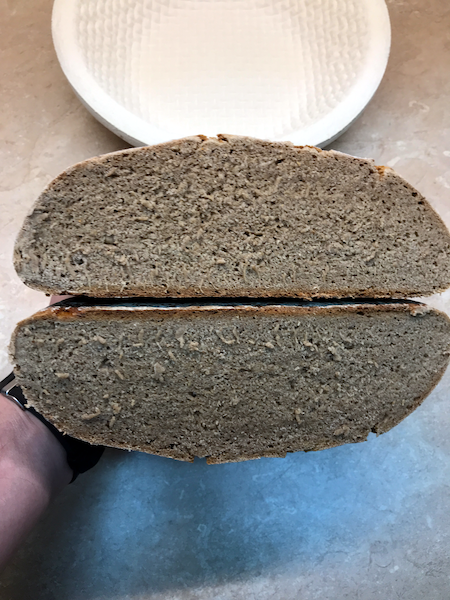 I just made his Jewish Pumpernickel pg 93...and then went to try and get more of the coarse meal flour but NO...only KA had it...and I much prefer to order 1 a year from them due to shipping. OH WELL...at least I have enough for 1 more pumpernickel loaf. I do have a case of fine dark rye though...and I like the 87% rye...but...such is way way sticky. Did you put it seam side down in banneton?? It cracked beautifully didn't it? Last time I tried one of the higher % the dang thing blew out a side and cracked too. Ain't nothing like a rye. Nice! for proofing. I used the wood pulp banneton (brotform) in the backround, but lined it with a flour sack cloth fearing the dough would stick like crazy. The cloth was well floured and the dough came out with no sticking at all. I was quite pleased with the way the cracks came out too. I used KA pumpernickel. For some reason I had it stuck in my head that KA was a finer grind than traditional pumpernickel. But it worked out alright. Well IF you don't have fine grind...then meal works! I can't remember the KA pumpernickel coarseness...BUT I *think* it was less coarse than Bob's is. I don't understand why it is so dang hard to get pumpernickel or other rye flours when I have a local mill 30 miles from me that produces organic flours. You just can't buy it anywhere unless you go pick it up at 25lbs at a time. Even Bob doesn't have it now.